Located in the Fraser Valley Abbotsford has an estimated population of 141,397 (2016) - the largest municipality of the Fraser Valley Regional District, the fifth-largest municipality of BC. The city is 145.00 sq mi and is the largest city by area in BC. 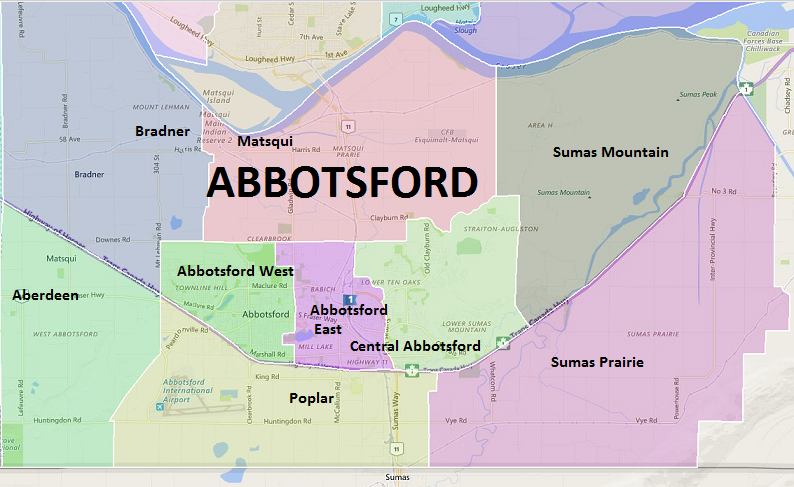 When you buy a home in Abbotsford BC and you have added benefit of being close to the Abbotsford International Airport (YXX), University of the Fraser Valley (UFV), the Tradex and many Golf Courses. Abbotsford has been named by Statistics Canada as Canada’s most generous city in terms of charitable donations for nine straight years. It has the 3rd highest proportion of visible minorities among census metropolitan areas in Canada, after the Greater Vancouver and Greater Toronto Area. Among other benefits, when you buy a home in Abbotsford BC you will appreciate being close to British Columbia's richest agricultural lands with farm fresh fruits, vegetables and dairy, family-friendly hospitality and sophisticated urban amenities such as High Street. Begin your search NOW below the map. . .